The debate about the relationship, or lack of relationship, between avant-garde art and left-wing politics has been rumbling on for a week or more now in the comments boxes of this blog. Despite or because of thousands of words of polemic, there appears no consensus over whether or not radical art can help to effect radical political change. One man who had no doubt about the connection between art and politics was Franklin Rosemont, the American labour activist and surrealist who died last week at the age of sixty-five. Rosemont was born into a working class family in Chicago, and at the age of seven he joined the Industrial Workers of the World, known colloquially as the 'Wobblies'. He would remain committed to the organisation for the rest of life, despite its steadily declining membership. Inspired by Jack Kerouac's On The Road, Rosemont left school at fifteen and hitched around America and Mexico, winding up in the Beat stronghold of San Francisco. During a subsequent journey to Europe he met the elderly Andre Breton, and became an instant convert to the Surrealist movement. Upon returning to America Rosemont founded the Chicago Surrealist Group and began to produce poetry and visual art. Another key member of the group was Philip Lamantia, who had also graduated from the Beat movement to Breton's rather austere aesthetic. I remember encountering the poems of Lamantia and other members of the Chicago Group during my undergraduate days, and being struck by how little they owed to the main tendency in American poetry in the '60s. While the Beats, feminist poets like Anne Sexton, New York School poets like Frank O'Hara and even doyens of the mainstream like Robert Lowell were trying to make their poetry casual and accessible, the American surrealists were churning out lines full of inscrutably strange images. Narrative and argument were rejected, because they were seen as impediments to the free expression of the subconscious mind. Although it was supposed to express the deepest impulses of its authors, the work of the American surrealists seemed to me oddly impersonal, and sometimes even cold. Perhaps Lamantia, Rosemont and co. were like the medieval mystics who tried to enquire so deeply into themselves that they would discover what was common to all humans. I must confess struggling to find much more than a tangle of incomprehensible lines and the occasional beautiful image in the work of Rosemont and his comrades. It was impossible not to admire the energy of the Surrealists, though, and the way that they tried to fuse their art with the radical politics which shook up the United States in the second half of the sixties. Rosemont was a scholar as well as an artist and political activist, and from the seventies into the noughties he turned out a series of essays and books about the history of the labour movement in the United States and overseas. His biography of Wobbly martyr Joe Hill became popular amongst scholars as well as activists, and was eventually translated into French. I am grateful to Rosemont for 'Karl Marx and the Iroquois', his long, stormy meditation on Marx's little-known Ethnological Notebooks. There are works that come down to us with question-marks blazing like sawed-off shotguns, scattering here and there and everywhere sparks that illuminate our own restless search for answers. Ralegh's so-called Cynthia cycle, Sade's 120 Days, Fourier's New Amorous World, Lautremont's Poesies, Lenin's notes on Hegel, Randolph Bourne's essay on The State Jacque Vaches War letters, Duchamp's Green Box, the Samuel Greenberg manuscripts: These are only a few of the extraordinary fragments that have, for many of us, exerted a fascination greater than that of all but a very few "finished" works. Karl Marx's Ethnological Notebooks - notes for a major study he never lived to write - have something of the same fugitive ambiguity. 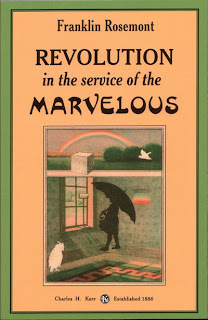 These extensively annotated excerpts from works of Lewis Henry Morgan and others are a jigsaw puzzle for which we have to reinvent the missing pieces out of our own research and revery and above all, our own revolutionary activity. For Late Marx, the motto doubt everything was no joke. Or at least it was not only a joke. Late Marx emphasized as never before the subjective factor as the decisive force in revolution. His conclusion that revolutionary social transformation could proceed from different directions and in different (though not incompatible) ways was a logical extension of his multi-linear view of history into the present and future. Rosemont urges the relevance of the Notebooks to fin-de-siecle struggles against globalisation and primitive accumulation in the Third World. In 'Late Marx and the Iroquois' Rosemont pays homage to EP Thompson, who had pointed to the importance of Marx's late work in his controversial 1978 polemic 'The Poverty of Theory'. Rosemont is less restrained than Thompson in his interpretation of Marx's fragmentary late texts, and his argument that the Ethnological Notebooks represent a complete repudiation of Capital is finally unconvincing. More careful scholars, like Haruki Wada and Raya Dunyaveskaya, have noted that Marx was reworking even the first, published volume of Capital right up until the end of his life, and incorporating his new insights into the book. Rosemont also makes the mistake of equating Marx's views with Morgan's, when in fact the Notebooks contain criticisms of Morgan's tendency towards a stagist view of human development. Raya Dunyaveskaya has shown that Marx's criticisms were ignored by Engels when he used the Notebooks as a source for The Origin of the State, the Family and Private Property. Despite their pompous claims, ninety-seven percent of the neo-Marxists are actually to the right of the crude and mechanical Marxists of the old sects, and the separation of their theory from their practice tends to be much larger. Certainly the Wobbly hobo of yesteryear, whose Marxist library consisted of little more than the IWW Preamble and the Little Red Song Book, had a far surer grasp of social reality - and indeed - of what Marx and even Hegel were talking about-than today's professional phenomenologist-deconstructionist neo-Marxologist who, in addition to writing unreadable micro-analytical explications of Antonio Gramsci, insists on living in an all-white neighborhood, crosses the university clerical-workers' picket line, and votes the straight Democratic ticket. I'm not sure if he would have approved, but I was proud to quote Rosemont's remarkable study of Marx's late work in my PhD thesis. Even if I couldn't appreciate the man's verse, I found a lot of poetry in his prose. Buy runescape gold as low Pirce! We never rest so that we can offer you the best. We're here 24 hours a day, 7 days a week. Get the most out of your game time and level with the best! Fascinating post. Breton spent much of the war in the US. Has anyone written about his influence on the art and writing scene here? Working class art in Auckland? out of which bloodred lilies appear. and glass were the faces in the last looking-glass. This is the first surrealist poem in English, published in October 1933. So long, Franklin, you hairy, helpful, hallucinating old wizard of the left. I first came across fellow worker Rosement and his equally improbable and kindly wife Penelope a few years ago, in the course of researching NZ's early radical literary traditions. I was startled to discover that a vast proportion of the wave of imported leftist reading matter (and it was practically all imported) which fed the dreams and desires of the largely autodidactic radical labour movement in the early 20th century originated from a single source, the Chicago-based Charles H. Kerr publishing house. It was equally surprising to learn that the company was still vigorously extant, its original principles intact, turning out many marvellous books annually under the slogan "Subversive literature for all the family". So I sent them my research on the NZ connection with their business, and Franklin (who had bought the company in the 70s to save it from insolvency) responded at characteristic length and generosity, sending me signed copies of several of his own works (including the biography of Joe Hill you mention above) and inviting me to contribute to a forthcoming one, a revised edition of the Haymarket Scrapbook. So I did, and we kept in touch, sending each other good stuff we'd come across and news of our local communities. I've never had a livelier, more welcome correspondent. He usually addressed me as Fellow Worker, meaning he saw me as a Wobbly like himself, and I wish I truly deserved such a tribute. I also wish we'd managed to meet up, and that he'd lived to finish a few more works in progress. But it would have been a tango of a tangi for old Franklin. Give them hell in heaven, you old bugger. I still have your copies of Franklin's books! I just realised as I posted a tribute up on my blog. Sometime you get a wrong number. "Hello, I'm comin' Louise. Don't you worry." "Hello--excuse me? I think you have the wrong number." "No. This is not Louise." I had not received a wrong number in years. I thought it strange this silly, annoying wrong number. I had just been to Franklin Rosemont's funeral. Waldheim Cemetery. Very sad day. I cried. I went home and re-read "An Open Entrance to the Shut Palace of Wrong Numbers"
I cried again and then, I laughed. Thank you very much for this post; it was a nutritious read. I have a little book on the original surrealist movement, published by Taschen, in which the author mentions most of the membership's inclination toward leftism at that time. I remember not being surprised at this when I first read it 3.5 years ago. I'm certainly not a historian, but atrocity in the name of communism may not have been in full swing at that time. However, with the help of my ingenious baboon engineer, I was rebuilt by a contingency of ghosts into an ectoplasmic nanomachine. This might be a good place to get some ideas about where to start looking. Also, if I recall correctly, Mark Polizotti's "Revolution of the Mind" discusses his American sojourn in some detail. Ernst and Duchamp were also in the US for a long time. Surrealism was very big in the US in the postwar period. Sorry this so short on detail, but it's something.